Congratulations to the Beresford High School One Act Play cast and crew on qualifying for the State One Act Festival! 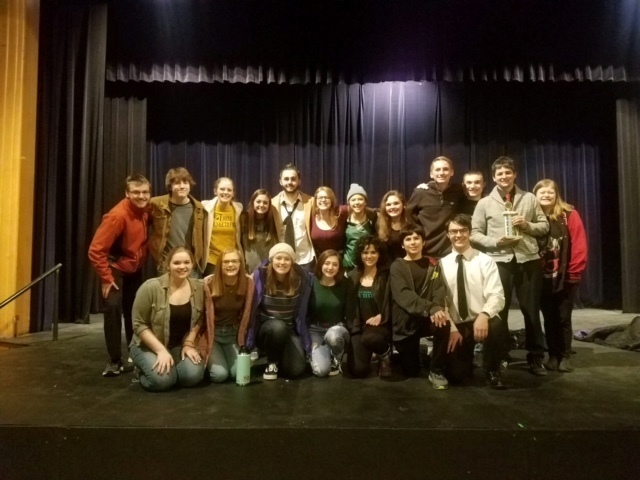 On January 22 at the Region One Act Play Contest at Mount Marty College in Yankton, BHS received a Superior ranking, in which all three judges awarded BHS 1st place! Congratulations to Kaylen Hoffbeck, Makayla Nelson, Caleb Weiland, Gabe Poppenga, and Isaac Andal for receiving “Superior” Actor awards at the Region Contest! Beresford High School will perform their play titled, “Cut” by Ed Monk, at the State One Act Play Festival. The State Festival will be held at Northern State University in Aberdeen on Friday, February 1. Beresford High School will perform at 2:45 p.m.
GOOD LUCK to our cast and crew! The director of theater productions for Beresford High School is Dr. Tommy Merriman.